This past weekend was a good weekend. No deadlines except that one that made a nice whooshing noise as it went by, nowhere to be, just an opportunity to enjoy things at a leisurely pace. Saturday, A-Flizzle and I got a wild hair and decided it would be fun to go on a six mile urban hike, which is a more adventurous way out saying that we walked through a few neighborhoods and down a few sidewalks. It’s kind of amazing the things you notice when you are on foot that you never see from driving around in a car. We found a house with a dinosaur in the front yard, several Florida rooms off the sides of houses with beds in them that we were hoping to catch someone dozing in, a new sports bar and restaurant being built, and we learned that the pedestrian crosswalks have absolutely no rhyme or reason for when they decide to let you cross the street. After a day of near perfect BG’s, around bedtime on Saturday night I realized that I wasn’t feeling too well, so I did a quick check to see where things were. 342. I was pissed. Are you for real?! I counted everything! I know I got the math right, or at least in the ballpark enough to not merit a stupid 342 BG. What the #$@#%#$?!!!! After I got done pitching a fit, I tried to think what might have jacked my BG up so high. Surprisingly, I don’t think it was the banana and Nutella crepe. There was nutritional info, and I’m pretty sure I was in the ballpark on that one. Since it was sunny and over 90 degrees outside when we were urban hiking all over town, I settled on the idea that the insulin in the tube of my pump probably got a little too warm during the activity and had lost its effectiveness. Insulin is supposed to be kept cool or at room temperature, and let’s face it, late Spring and Summer in Florida is far from being room temperature by any stretch of the definition. Something you have to be aware of if you’re going to sport an insulin pump is that, every once in awhile, heat happens. I dosed down the 342 BG with a shot of insulin via the old faithful syringe, and then switched out the insulin in my pump. Either I overestimated how much I needed to pull that 342 BG back down to normal, or the activity of the day finally caught up with me, because I woke up around 3:00am at BG 35. After a juice box and a couple spoonfuls of peanut butter (which I may or may not have shared with Hopper dog), I woke up in the morning with a perfect BG of 88. Diabetes is a total game of numbers. In order to stay alive we have to count everything. And guess. A lot. We have to know how many carbohydrates are in everything that we put in our mouth, what our blood sugar (BG) level is at the time, and guesstimate how much activity (or lack thereof) is going to affect our metabolism and BG level. Then, on top of that, there are ever present questions about how accurate our BG meters are, we never really know for sure how effective the insulin that we’re injecting is going to be (especially after it has been in an insulin pump for a few days), and our bodies sometimes process that magical life elixir differently than yesterday, when we had the same food, the same activity, and the same BG levels. My endo says that “doing the same thing over and over again and expecting different results is insanity…unless you have diabetes.” In Martin World, it’s just another day. ← Why You So Stubborn, Diabetes? 1. banana and nutella. yum! 3. ick. i can only imagine how gross you must have been feeling on that glucoaster. double yuck. I love the term “urban hike” it’s so adventurous! 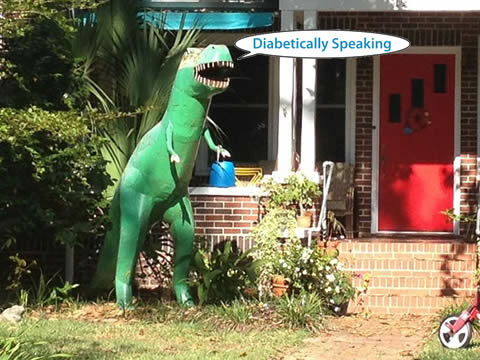 You are one of my favorite diabetes bloggers! I’m so happy to see a new post. I live in a divided home. My husband says NOOtella. I am with you, and very glad to be so. love the ‘urban hike’ notion, it’s kinda like geocaching but without the cache! your endo sounds like he gets it.